12 x 12 Heavy Gauge Steel Floor Register Discounts Apply ! Heavy duty steel vent by Hart and Cooley is a commercial grade large floor register with an adjustable damper that can be opened or closed completely. 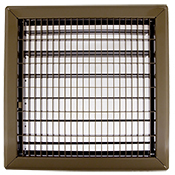 This vent has both a classic design and timeless quality, providing you with one of the best vent choices for both residential and commercial installations. The large size of this heavy duty steel vent is hard to find, but can be found right here with the quality guaranteed by Hart and Cooley manufacturing. Please note these registers are a special order item, and may take a few weeks for delivery. Heavy duty steel grilles are also available. Grilles do not have dampers, allowing for continual air flow. Regarding measurements: Please ensure you are measuring the actual size of the hole into which this product will be placed. Do not measure faceplate for dimensions. For example, if floor hole size is 12 x 12 inches, please order a 12 x 12 inch register. Faceplate thickness is approximately 3/16 inch and has overall dimensions 13 13/16 x 13 13/16 inches. The damper will drop into the hole opening approximately 2 7/8 inch. See enlarged photo for register and damper specifications.